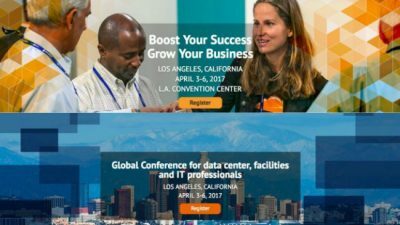 LOS ANGELES — Data Center World, the global conference for data center, facilities and IT professionals, and HostingCon Global 2017, the global event for the cloud and service provider ecosystem, announce today the launch of the inaugural press room and dedicated online media hubs for Data Center World and HostingCon, inviting trade and business publications from around the world to attend the co-located events taking place April 3-6, 2017 at the LA Convention Center in Los Angeles. Data Center World and HostingCon 2017 will feature a combined exhibit hall that includes both conferences’ exhibitors. Attendees will be able to discover even more products and services than ever before and enjoy networking with the expanded audience. iMiller Public Relations (iMPR), an independent public relations and content marketing consulting firm, is managing the media hub, located at the LA Convention Center, Room 512. On behalf of participating Analysts and Media, iMPR is accepting press kits and embargoed or regular press releases prior to and during the conference on both organization’s behalf, as well as providing general assistance during the event. Companies can submit press releases electronically to Data Center World and HostingCon online and can leverage a special discount rate for wireline distribution offered by Marketwired, now Nasdaq, also available through the same online link. Monday, April 3: 12 p.m. – 5 p.m.
Tuesday, April 4: 9 a.m. – 4 p.m.
Wednesday, April 5: 9 a.m. – 4 p.m.
Media outlets participating at HostingCon and Data Center World include Data Center Knowledge, Data Center POST, CloudPOST, Gigaom, IT Weekly, Mission Critical Magazine, The WHIR, among many others. If you are a member of the media or press and would like to be considered for a complimentary pass, please review the criteria for media accreditation. Qualified candidates can apply for consideration by contacting iMiller Public Relations at hostingcon@imillerpr.com or datacenterworld@imillerpr.com. To learn more about HostingCon Global, visit www.global.hostingcon.com. For more information about Data Center World, visit www.global.datacenterworld.com. HostingCon is the global event for the cloud and service provider ecosystem. The conference connects the industry including hosting and cloud providers, MSPs, ISVs and other Internet infrastructure providers who make the Internet work to network, learn and grow. HostingCon is a Penton event. For details about HostingCon, visit www.HostingCon.com. Penton Technology, HostingCon and Data Center World are part of Informa, the international business intelligence, academic publishing, knowledge and events group. Informa serves commercial, professional and academic communities, helping them connect and learn, and creating and providing access to content and intelligence that helps people and businesses work smarter and make better decisions faster. Informa has over 7,500 colleagues in more than 20 countries and a presence in all major geographies. It is listed on the London Stock Exchange and is a member of the FTSE 100. This entry was posted on Monday, March 20th, 2017 at 8:04 am	and is filed under Featured. You can follow any responses to this entry through the RSS 2.0 feed. Both comments and pings are currently closed.